The first organ at Tilehouse Street Baptist Church was built in 1866 byJoseph Walker and enlarged by William Hill & Son in 1891. In 1935, Walker's were again engaged to dismantle the by now unreliable and noisy hydraulic	blowing mechanism and replace it with an electric blower. At the same time, the organ was cleaned, various necessary action adjustments were made and a Viola	rank added in the Great organ (This rank had been provided for in Hill's 1891 rebuild but the pipes had not been fitted). The Viola voice was installed on the recommendation of Tilehouse Street's then organist and choirmaster, W.B. Gatward, who felt that a quiet stop in the Great organ would be a worthwhile acquisition. Both of the firms of Walker and Hill have, over the years, earned themselves international reputations among organ builders. The late Dr. W.L. 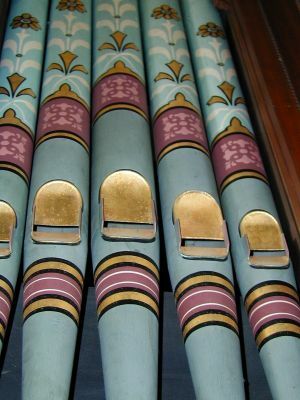 Summer stated that Walker's Diapasons had a magnificent "rolling" tone; he went	on to affirm that "old Walker organs, such as those at Romsey Abbey (Hants.) and at St. Mary's Portsea (Portsmouth) should be regarded as national treasures	and treated accordingly". One of the firm's more ambitious schemes was the five-manual organ at Tewkesbury Abbey. Hill's have built organs for Birmingham Town Hall, Beverley Minster and King's College Cambridge! Our organ has three manuals (keyboards), each with 56 notes, and a pedal	board of 30 notes. The action by which movement of the keys is transmitted to make the pipes sound is a mechanical "tracker" system. Each key is connected by	thin wooden strips to a pallet (a hinged valve) which opens to allow wind to pass to the pipe. Many musicians prefer a tracker action, rather than an electrical method or a combined electric/ pneumatic combination, since it is reliable, it allows positive and direct control of the opening of the pallets	and it is simple to maintain. The instrument contains about 1700 pipes, some wooden and some of metal,	and arranged as shown in the Specification below. Each of the four departments (Swell, Great, Choir and Pedal) is totally	separate, although they may be used together by means of accessories known as "couplers". The pedal board is at floor level and has sharps and flats similar	to those on the manual keyboards. 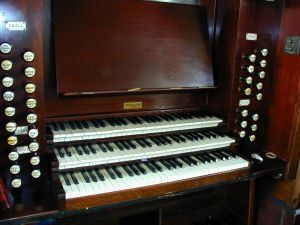 The lower keyboard serves the Choir organ, consisting mainly of the quiet stops (with the exception of the Clarinet, which may be used as a solo against the quiet stops on one of the other manuals). The middle row of keys are for the Great organ. The stops are generally of bold tones for use as an accompaniment to congregational singing. This division is crowned by the Trumpet, which is a fine climax stop. The uppermost manual is for the Swell organ and is made up of both quiet	and loud ranks, some of which can be used together with the Great organ in creating a massive tonal build-up. 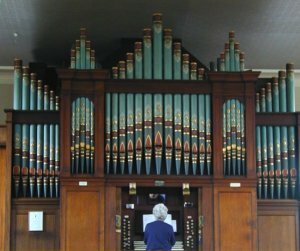 The pipes of both the Choir and the Swell organs are enclosed in	substantial boxes with louvred fronts which may be opened or closed, by tilting pedals just above the main pedal board, so as to increase or decrease the sound	volume. One of the most thrilling sounds is that of the full Swell with the box	initially closed and then gradually opened to allow full reign to voices such	as the Horn, supported by others in chorus. The pipes, as already mentioned, are made of metal or wood. The figure	given after them in the Specification refers to the length (in feet) of the longest pipe in each rank or stop; this gives a	guide to the lowest note available. 8-foot stops are generally of the same pitch as the corresponding note on a piano, while 16-foot stops are an octave	lower, 4-foot stops are an octave higher and 2-foot stops are two octaves higher. Selection of the various lengths of stops enables the organist to build up what are known as "choruses", e.g. one or other of the two Great Diapasons together with the Principal and the Fifteenth, or, on the Choir, the Lieblich	Gedackt, the Lieblich Flute and the Piccolo. Also, one may play a 4-foot rank an octave lower, or indeed a 16-foot rank an octave higher, with quite acceptable results. As an illustration, the 16-foot Bourdon on the Swell is quite pleasant an octave higher, and in combination with the Salicional and the	Salicet a truly delightful quiet chorus may be achieved. Similarly, against a moderate build-up of swell stops, the Great Trumpet played an octave lower is	truly telling. These are but a few examples of stop selections that our fine instrument offers. Use of the couplers, too, allows the player to select quite	pleasing combinations, e.g. the pedal stops are rather too loud for use with the Choir Dulciana (the quietest stop on the organ), but this may be overcome	by coupling the Swell Bourdon to the pedals, giving a perfect balance. The stops marked on the Specification with an asterisk ("*") are "reeds", where a sound is produced by a reed or tongue that vibrates in the current of air. Reed stops generally imitate orchestral instruments, however the Vox Humana is something of a misnomer, as by no stretch of the imagination can it be said to resemble the human voice; the name	is a legacy from Victorian/Edwardian times. It does not stay in tune for long and so is rarely used. Stops that are not marked with an asterisk are known as "flues". The	wind blowing upwards from the chest at the foot of the pipe passes out of a slit or mouth at the front, and this causes the column of air above to vibrate. Some of the flue pipes are called "strings" and have an edginess to their tone that is said to be reminiscent of a string tone. Other ranks are called "flutes", and these have a more flute-like timbre, as their names suggest. The basis of the English organ tone is, however, the Open Diapason, of which our organ is blessed with three good examples, especially No. I on the Great organ, which has a bold round tone, giving a solid basis on which a chorus may be built. The three-rank Mixtures on the Swell and Great organs consist of three	pipes, one of 2-foot pitch, one of 1-foot pitch and the other, called a "mutation" or "twelfth", midway between the two. These Mixtures are never used alone; their purpose is to add brilliance (or " sparkle") to choruses of such combinations as a Great Diapason, Principal and Fifteenth. Among the Accessories, there are Combination pedals, which permit the organist to change groups of stops without removing his/her hands from the keyboards. The Tremulant is a device which causes the wind supply to the Swell organ to pulsate and, when used with discretion in quiet passages, tends to create a restful and reflective atmosphere. Something of a similar effect may	be obtained by the use of the Voix Celeste on the Swell with the Salicional and the Stopped Diapason, the Celeste being deliberately tuned slightly sharp to produce an undulating "beat" in combination with other stops of similar power. 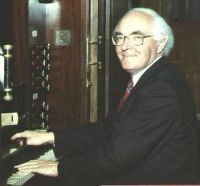 The above description of the organ is adapted from an article by the	late Cyril M. King, formerly organist and choirmaster at Tilehouse Street. It first appeared in the Church magazine, Outlook, in August and September 1975. The late David Atkinson, formerly Master of Music at St Mary's, Hitchin, was a good friend of the Tilehouse Street organ. In 1997 he submitted its details to the National Pipe Organ Register and it was awarded a Historic Organ Certificate (Reference N13194), now	displayed proudly on the case. Thanks to Paul Ebling for keeping us up to date of the NPOR location.